After this Saturday night’s CD release party and show you will see that we have nothing else on the calendar. This is because our band is expecting two babies! 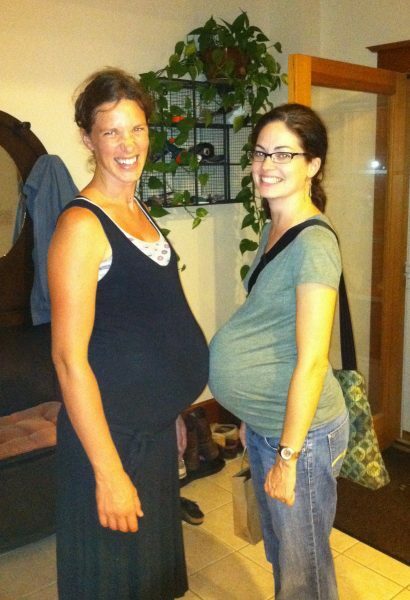 Andy and Caitlin with their first and Monica and Aaron with their third – both due in October! But do not fear, we will let you know as soon as we schedule some winter shows. We will all need a winter pick-me-up come January for sure. 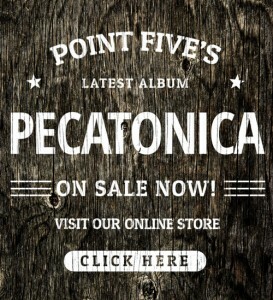 The Point Five Album is here! Our debut album is here! Check out some of the tracks below on Point Five Radio! You can place your order NOW through the Point Five Store. While you’re here, please sign up to be on our mailing list, friend us on Facebook, and follow us on Twitter! Thank you for your support! Thanks to all of you who risked the rain to come to our Jammin’ on the Porch last night in Mineral Point. What a magical night! We had such a fabulous time and can’t wait to do it again next year! P5 this Friday @ Midway Lanes! Bring a lawn chair and/or blanket! Hope your plans for next weekend will include a visit to Dino’s in Dodgeville to hear Point Five play on Saturday night. See attached poster. We’ll be making music from 8 – 11 (or later…). No cover charge! Dino’s has some really good food and great beer on tap!